I am originally from Okarche, Oklahoma, and attended Oklahoma State University where I graduated with a BS in Elementary Education. I took my first drawing class while at OSU and absolutely loved it…even when I had to draw wrinkly paper bags on charcoal with an eraser. Since graduation, I have lived in Houston, Texas where I have held jobs from teaching school to running a concrete manufacturing plant…and now I’m proud to say my very own drawing business. I have been formally trained in drawing from The Houston School of Art and Design and would like to thank Shawn Carson and Charlie Brown for all of their artful wisdom. I would like to share a story about my first commissioned drawing. 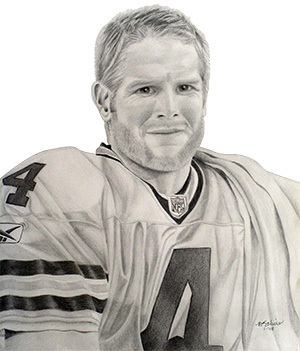 It was for a 13 year old boy, Christopher, whose hero is Brett Favre of the Green Bay Packers. I was delighted to draw him and after completion personally delivered it to him. I told him to close his eyes and I held out the newly framed and matted portrait for him to see for the first time. Christopher, who doesn’t show a lot of emotion, began smiling from ear to ear and his eyes lit up with happiness. Christopher had an enormous smile on his face when I walked out the door. I receive as much joy drawing the portraits as I hope you will experience in receiving them. I draw exclusively from photographs and it can take anywhere from 20 to 25 hours per portrait. If you have any questions or comments, please do not hesitate to email me. I would be honored and privileged to draw a portrait for you and hope that you see eyes that sparkle with soul, too.